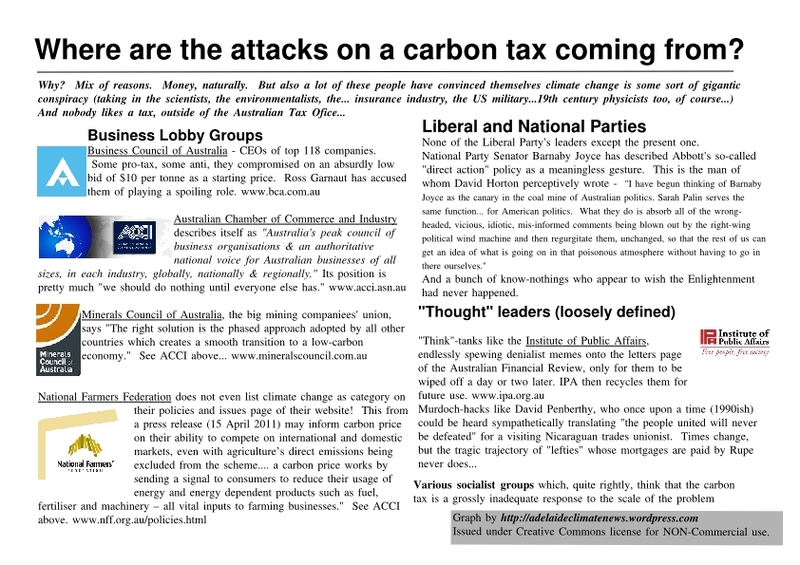 Bluffer’s Guide – Who’s agin a Carbon Tax? THE federal government appears to have made little progress in reaching a carbon pricing compromise with the Australian Greens and crossbenchers during two days of “robust” talks in Canberra. Greens Senator Christine Milne today said the Multi-Party Climate Change Committee (MPCCC) remained split on key issues surrounding the government’s plan to introduce a carbon tax and emissions trading scheme. Asked if any progress had been made during the talks, Senator Milne said: “I think we’re a lot better informed about the complexities. You can – and should – read the rest of it via the link above. It sounds like there was a “free and frank exchange of views”, eh? I went and googled the outfits mentioned in the story, and it helped me a lot. The Business Council of Australia is an association of the CEOs of 100 of Australia’s leading corporations with a combined workforce of one million people. It was established in 1983 as a forum for Australia’s business leaders to contribute to public policy debates to build Australia as the best place in which to live, to learn, to work and do business. Is Australia’s peak council of business organisations& an authoritative national voice for Australian businesses of all sizes, in each industry, globally,nationally & regionally. The Australian Chamber of Commerce and Industry (ACCI) is Australia’s largest and most representative business association and the peak council of Australia’s State and Territory Chambers of Commerce and our major National Industry Associations. So I wonder if they have a little “good cop/bad cop” thang going on? A couple of days ago the BCA called for at the carbontax to start at ten bucks a tonne. So a day latter the ACCI say “No Great New Big Tax on Everything.” Playing Malcom to the BCA’s Martin? Pressure for a new clean energy technology fund attached to a new carbon price scheme is growing from a broad coalition of unions and environment, investor and renewable energy groups ahead of negotiations this weekend between Labor, the Greens and independent MPs. The Australian Manufacturing Workers Union (AMWU) yesterday called for more than $6 billion over the next six years to be set aside for a new clean energy fund and energy efficiency programs. AMWU secretary Dave Oliver said the government needed to establish a fund to partner private investors and provide grants, loan guarantees and tax breaks to support the low emissions industry and technoolgy development….